Village Code and the Building Department require permits be granted for nearly all commercial and industrial work including, carpentry, concrete, plumbing, fencing, roofing, masonry, signage, electrical, fire safety and HVAC. For questions on whether a permit is required for the work you are planning, please contact the Building Department using the information on the right side of this page. Before any Property can be occupied, the new owner/tenant must obtain an Occupancy Permit. This applies to existing business’s that change ownership or business name. Applications for Occupancy Permits shall be obtained at the Building Department. Packet must be filled out completely and returned to the Building and Zoning Departments. Health inspections are performed in tandem with all pre-sale and occupancy inspections of commercial, industrial and hotel properties. The Health Department inspects food establishments that interact with the public through human consumption. 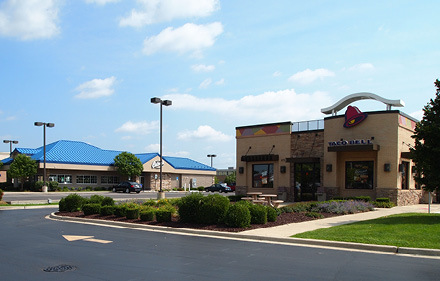 These establishments may be a fast food restaurant, pizza parlor, bakery, wholesale processors, restaurant, daycare center, lodging establishment, grocery store, or deli. Commercial vehicles which store, deliver or sell food items are to be inspected and licensed. All inspections are conducted and based upon the Rules & Regulations of the Illinois Department of Public Health: Food service sanitation codebook. Inspections are conducted every six months; unless an establishment requires additional follow-up visits. Inspections are also conducted immediately after a complaint is received from a concerned consumer. All Signs and Elevators in the Village are required to be inspected. Signage is inspected annually and elevators are inspected bi-annually. All new signage requires a permit to be obtained at the Building Department.